Prominent & Leading Wholesale Trader from Noida, we offer part (ab) cartridge dispensing robot, rotary table gluing machine with pick & place and rotary table dispensers- silicon gasket. This dispenser suits 1:1-10:1 each kind of syringe-loaded A, B component resin. Rotary tables are used for semi-automatic dispensing applications of rotary parts. Tables can be programmed for auto cycling allowing the operator to remove and place new parts for dispensing. 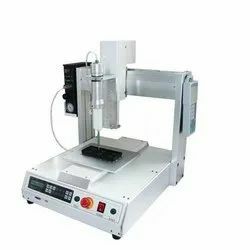 Rotary tables Dispenser are used for semi-automatic dispensing applications of rotary parts, table for dispensing circular beads, such as 300ml-310ml RTV, silicone on circular parts up to 15" in diameter.